Plot: The Nazis created the synthetic human called Frankenstein and sent its heart to Hiroshima, japan. But Hiroshima is A-bombed. After WW2, the doctors found a strange boy there. The boy is Frankenstein, he grew gigantic by influence of radioactivity. 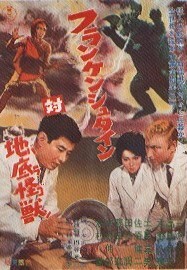 Continues: "Frankenstein no kaijuu: Sanda tai Gailah"